Coolest Campgrounds for Families – No Tents Needed. Camping vacations still offer contact with Mother Nature but no longer require sleeping on the ground to ensure the camping experience is real. The coolest campgrounds deliver extra vacation punch either with spunky family activities or unique accommodations. It is possible to stay in a hobbit house, sleep in teepee (tipi), snooze in a covered wagon, dream in a treehouse or snuggle with your kids a railway caboose. How cool, right? 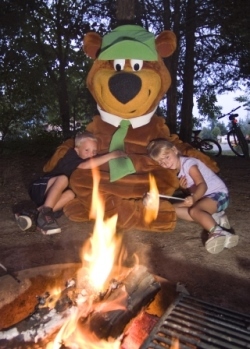 Jellystone Camping Resorts are located in some of the coolest family vacation spots and Yogi adds extra fun to everyday. Coolest campgrounds offer the potential for unique family camping experiences and effortless fun. Gone are the days when family camping meant a cozy tent, a collection of slightly damp sleeping bags, soggy matches and a lantern. New age family camping includes extra cool sleeping spots and plenty of unique vacation activities to share with your kids. From teepees (tipis) and treehouses to rail cars and bunkhouses the coolest campgrounds offer families green space, unique sleeping options, and earth-friendly ways have fun with your kids. 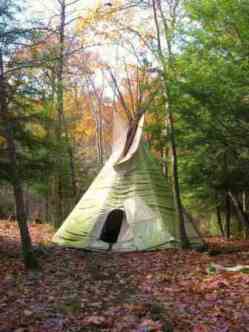 Abrams Creek Campground in West Virginia offers teepees for the perfect family camp out. Just as no two families are the same, no two family camping vacations will ever be the same. My list of the coolest spots favorites features variety. Maple Tree Campground in Maryland – Sleep in a hobbit house for your family and hike Appalachian Trail. Abominable Snow Mansion near Taos, New Mexico – Snuggle in a summer teepee and trek with a llama. Country Woods Inn near Glen Rose, Texas – Reserve your own Santa Fe rail car and walk where dinosaurs roamed. Rancho Oso Camping Resort near Santa Barbara, California – Snooze in a covered wagon and enjoy daily trail rides. Bruneau Dunes State Park and Observatory near Mountain Home, Idaho – Rent a frontier log cabin and stargaze with astronomers.